Mediating Conflict: A sort of 'shovelware' at the BBC? 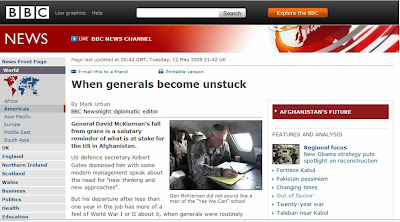 Just now, I was putting together a round up of blogging reaction to the appointment of LTG McChrystal as commander of US forces in Afghanistan. 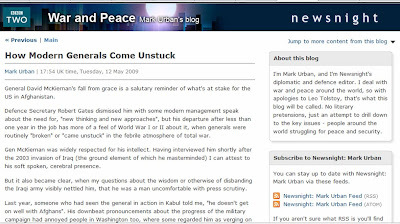 I noticed that Mark Urban had a written a blog post about it for Newsnight. But then I also found a more or less identical copy of the post on the main section of the BBC News website. I always thought part of the idea of blogs at the BBC was that they offered something different to the rest of BBC content in terms of style, tone or information, even if everything must adhere to the same editorial values. I suppose this demonstrates that journalists don't always have the time to re-version material. I'm not sure which came first - the online piece or the blog, but if that was me I'm pretty confident I wouldn't bother spending the time to put either one of them into a 'blog' or 'website' 'style'. I wonder whether we need two copies of the same thing on the same website, but there may well be people who read the BBC's blogs and people who read the rest of the website - why not make it available to both audiences?